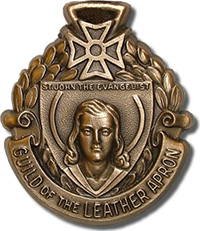 The Guild of the Leather Apron, also known as the Advisor of the Year Award, is designed to give singular recognition to a DeMolay Advisor who in the past year has made outstanding contributions to the growth and success of the Order of DeMolay, especially within a local Chapter. The honor may be conferred upon any DeMolay Advisor, regardless of Masonic affiliation. Below is a biography of the most current recipient as well as a listing of all those who have been previously recognized. “Dad Bill Holtzer has been an Advisor for Westmoreland DeMolay for 9 years, having served since his son, Isaac joined in late 2008. He has been a major influence in the lives of many members of Westmoreland Chapter. He has served as Chapter Advisor, and makes Ritual work a major part of their success, while providing a fun loving environment for the young men. He has since signed on as the Assistant Director of Ritual for Pennsylvania DeMolay.